We are thrilled to announce the release of our new subscription center! From this page you are able to view & edit your Newsletter and Action Alert subscriptions all on one page. 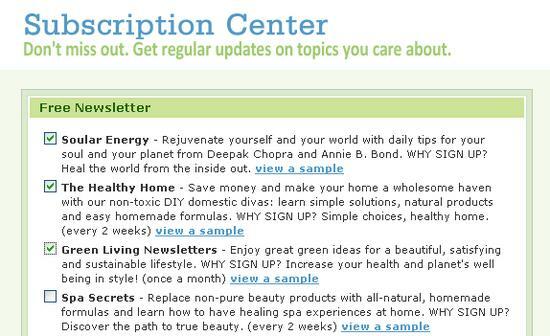 You may also change the email address where you'd like to receive our mailings from the subscription center. If you are receiving green star, butterfly, group posts and other notifications that you wish to no longer receive, please visit your notifications page to manage your settings. You have the option to set-up email reminders to visit the Care2 click-to-donate races. To manage your reminders you'll need to visit each race reminder page individually. For easy access to all the race reminder pages, please visit our race help page. Group tracking is a little different than group messaging. You may wish to track a particular discussion thread within a group. You may sign-up for the tracking from within the thread and you may also cancel from within the thread. If you've unjoined the group you may need to be manually unsubscribed from a group list. In this case, please send us the email address where you are receiving the mail and the header of email (make sure include the sending email address).